Joseph L. Druce, while being interviewed by a prison psychiatrist in 1989, declared that he expected to "go to Satan" and await the arrival of his enemies, and announced, "I'll die before I serve a life sentence!" A more detailed picture began to emerge yesterday of Druce, a onetime truck driver and mechanic who authorities say beat and strangled John J. Geoghan at a maximum-security state prison Saturday. Court records obtained by the Associated Press said that Druce had been under various forms of psychiatric treatment since about age 5 and had taken medication for his mental condition until his middle teens. 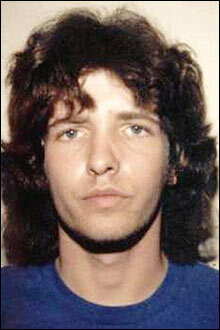 By then, Druce had become addicted to various drugs, the records showed. Druce was born Darrin Smiledge in Danvers in 1965, the son of a sheet metal worker. He finished the 10th grade before taking jobs as a mechanic and truck driver, according to court records. He changed his name in 1999, while in prison. His criminal career began soon after he left high school. He was charged with more than two dozen crimes, from drug possession to larceny to forgery. It was in 1988 in Gloucester that Druce's life of crime took a violent turn. Druce was hitchhiking with a friend in Gloucester when a man who drove a bus for the elderly picked them up. According to testimony during the trial, once they had arrived in a secluded section of Gloucester, the driver, 51-year-old George Rollo, touched Druce in the groin, and Druce reacted violently, beating Rollo, tying him up, and throwing him in the trunk of Rollo's car. After Rollo's beating, Druce and his friend picked up some beer and Druce drove the car to a parking lot near the North Shore Music Theatre in Beverly, where he strangled Rollo with a rope, the prosecutor said. He was convicted of first degree murder and sentenced to life in prison. While Druce was in prison, a psychiatrist noted his rage in explicit detail. "Angry, frustrated, blaming, remorseless, intense, determined man, believes in Satan, unafraid, laughing as he declares his intent to kill himself," the psychiatrist's notes said. In a May 2001 letter to prison officials, Druce offered to provide information on the unsolved murders of two Massachusetts girls, Molly Bish and Holly Piirainen, in exchange for a commutation of his life sentence. Worcester District Attorney John Conte said investigators looked into Druce's offer but found that it wasn't credible. In 1999, Darrin Ernest Smiledge formally applied to change his name to Joseph Lee Druce, according to court records. In the space marked "reason for change," Smiledge wrote, "Saftey and enemy issue's, very important to change identity." Druce's father, Dana Smiledge of Byfield, said Saturday that his son has had a longstanding animosity toward gay people, Jews, and African-Americans. Druce also pleaded guilty last year to mailing anthrax hoax letters to 39 lawyers around the country with Jewish-sounding names. Dana Smiledge said Saturday that Druce had also threatened to kill his family. Efforts to reach Druce's former attorneys were unsuccessful yesterday. J. Martin Richey, who defended him in the anthrax hoax case, did not return two calls yesterday. Martin Gideonse, who defended him in the 1988 murder case, died several years ago. Stephen Kurkjian and John Ellement of the Globe staff and Globe correspondent Renee Wright contributed to this report. Material from the Associated Press was also used.